What’s better than riding a bike and taking the stairs? Doing both at the same time. That’s exactly what the Nustep TRS 4000 cross trainer does for the typical homeowner. In lieu of bulky treadmills and ellipticals, the cross trainer allows for a seated cardio workout using a step motion. This combines the seated position of the typical recumbent bike with the leg and glute workouts of the typical step machine. As a result, the cross trainer is appreciated for its ability to tone the leg muscles, improve cardio endurance, and reduce the level of strain on the knees, hips, and spine, during a particularly vigorous cardio session. With its long list of included features the Nustep TRS 4000 adds portability, convenience, and easily accessible data to the mix as well. The TRS 4000 comes with a unique design that simulates the motion of walking, even while users sit in the seat and press forward with their legs during the workout. This increases cardio health dramatically. Tension levels can be adjusted with ease, allowing even the most advanced runners and cardio enthusiasts to challenge themselves and reach a high target heart rate for endurance mastery. The comfortable TRS 4000 seat was specifically designed with materials that absorb shocks and vibrations from the equipment, allowing for a smoother workout that’s more comfortable even during longer periods. 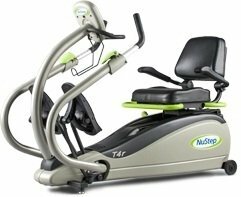 At just 205 pounds, the Nustep TRS 4000 cross trainer is among the lightest models on the market for homeowners and is therefore a perfect option for home gyms in smaller bedrooms or other tight areas where storage might be necessary. The cross trainer is a relatively novel piece of equipment for most homeowners, many of home naturally consider the treadmill or elliptical when they round out their home gym with some cardio equipment. The cross trainer, however, offers a similar workout with a far smaller footprint and less energy use. The Nustep TRS 4000 is designed specifically for home use, and comes with enough features and adjustments to accommodate people of varying fitness levels. Up to ten different workouts can be selected at the outset of a typical cardio session, ranging from high intensity options to longer, slower distance choices that might be better for those new to cardio training. The seated position of the cross trainer is specifically designed to accommodate those who typically suffer from joint or back pain while they engage in other types of cardio activity. In fact, the Nustep TRS 4000 is consistently recommended by physical therapists for those patients who work out at home and need to avoid spinal compression, joint pain, or exacerbation of existing arthritis symptoms. Despite its reputation for being easier on the joints, the Nustep TRS 4000 is not necessarily “easy” in terms of workout. It works the calves, quads, and glutes, throughout the workout, and uses enhanced tension to enforce a higher heart rate that leads to greater cardio endurance. This allows for a more significant calorie burn and can easily jumpstart the process of weight loss in most users. The 205-pound weight of the Nustep cross trainer is actually pretty light relative to other models on the market, but many homeowners might find that this is still quite heavy when they need to move the equipment. In fact, it’s likely that moving the TRS 4000 into storage will require the work of at least two people in order to ensure safety from injury. Even so, the TRS 4000 does offer a compact footprint that should make it less likely to be placed into storage in the typical home. The TRS 4000 is a different type of cardio equipment, combining the position of a recumbent bike with the motion of a stair climber or treadmill. This is its primary feature, but it definitely takes some getting used to. Those who have never used a cross trainer will want to start out with relatively low resistance and take it easy, since the new position of the workout could alter their overall cardio endurance, challenge their strength levels, and alter the typical cardio experience for even seasoned runners. Nustep’s TRS 4000 cross trainer is so good at what it does that even physical therapists have taken to recommending it for certain patients. The equipment requires no external power source, is compact enough to fit into particularly tight spaces, and places no added strain on the spine or numerous joints. It offers adjustable tension levels for excellent endurance training and muscle toning in the legs, and is easily assembled by even a single person. That makes the Nustep model a great fit for those who wish to maintain a high level of fitness while preserving the function and integrity of their back and joints in the process.